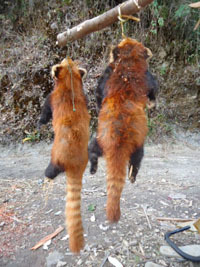 Fauna & Flora International researchers say they have captured the first film footage of wild red pandas in Burma in the mountains of Kachin State. RANGOON — Fauna & Flora International (FFI) researchers announced that they have captured the first film footage of wild red pandas in Burma in the mountains of northeastern Kachin State. “The footage shows a pair of red pandas crawling slowly on a rocky landslide caused by Chinese logging up to the ruined forest to feed on bamboo leaves,” the environmental group said. The red panda is listed as vulnerable on the IUCN Red List, with fewer than 10,000 mature individuals estimated to survive in the wild in the temperate mountain forests of the Eastern Himalayas, which range from Western Nepal to China. 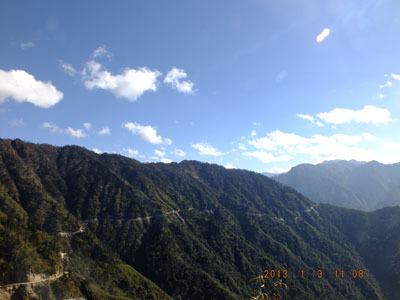 The Himalayan forests of Kachin State and its wildlife, which includes other species such as the critically endangered Myanmar Snub-nosed Monkey, are under threat from poachers and illegal logging by local loggers and Chinese companies that are supplying high grade timber to traders across the border in nearby China. In April, FFI announced that it was working with Burma’s Forest Department to create a new national park named Imaw Bum in Hsalaw Township in order to protect the unique mountain forest and its wild life. “We hope that the national park designation, combined with Myanmar’s recent raw log export ban, will encourage the Chinese government to stop loggers venturing into Myanmar,” said Frank Momberg, FFI’s country director for Burma. The planned park area is under control of a pro-government militia called the National Democratic Army of Kachin, according to FFI, which has said that the area is not directly impacted by the ongoing Kachin Independence Army insurgency, although the rebels control an area south of the park.